To discuss price, details and to order please call me at my toll free telephone number 1-800-356-6310. Accepted are VISA, MasterCard, Discover, American Express & PayPal. Personal checks may be accepted, however items will not be shipped until the funds have cleared. Sterling silver items may also be special ordered in gold. All special orders and custom work will require payment in advance and have delivery times which will be discussed prior to payment. Normally items are shipped within two days. In the rare event that an item is temporarily out-of-stock I will contact the Buyer with a delivery time and an option to either cancel the item and get a full refund or continue with their purchase. It is typical for an item to take three weeks to cast and finish. Please go to the <About> page for information on creating this work. Of course, one-of-a-kind items are gone when they are gone and will be noted as "sold" immediately on the web site. 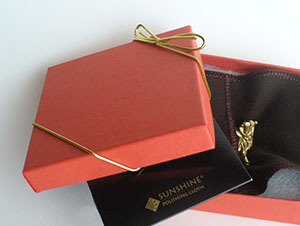 Each item is packed in an anti-tarnish pouch and includes a polishing cloth all nicely gift boxed. Items will be shipped by United States Postal Service Registered Priority Mail using their flat rate boxes including insurance and delivery conformation/tracking. (Single items generally fit into the small flat rate box.) Any single package containing over $1,000.00 will also require a Return Receipt. For destinations outside of the United States please contact for carrier information and a shipping quote. Return Policy: Please notify me immediately if there is any dissatisfaction so that I may promptly address your concern. Special orders and custom item sales are final and cannot be returned. (Shipping insurance is to cover any potential damage or loss.) All other items may be returned within 3 days of the date received as indicated by Delivery Conformation for a refund of the item price minus an 8% restocking fee. Please notify me immediately if there is to be a return. Returned items must be in their original unused condition with all included materials and shipped with tracking. A refund will be issued by the same means of payment only after items are received and condition verified.